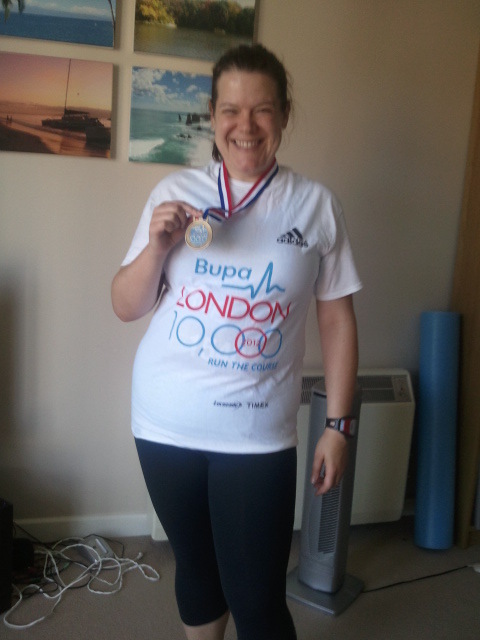 Today I ran the BUPA 10K in 25 degree London heat. 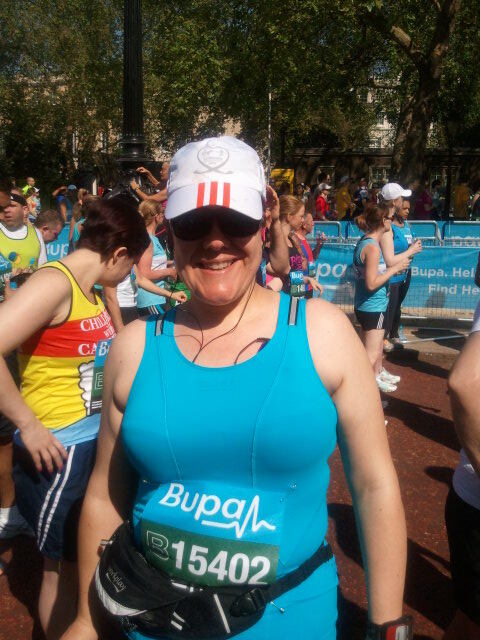 This was my first ‘proper’ event since the London Marathon. I’ve done a couple of the British Heart Foundation jogs in the last couple of weeks but they are definitely fun runs rather than competitive events. I hadn’t really followed any particular training plan for today, my aim was just to get around, hopefully running the whole way and enjoy the run. 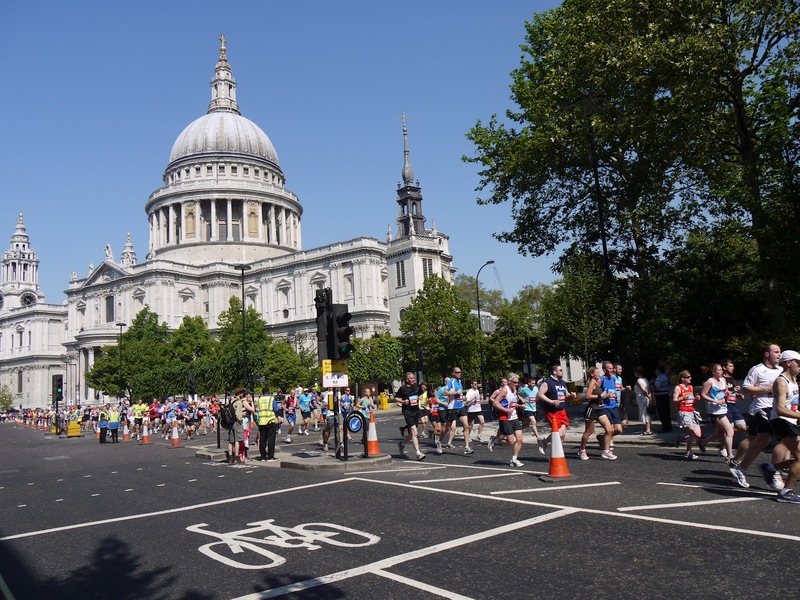 The course is the same as the one which will be used for the London 2012 marathon route – they will run 4 laps of the 10K route which starts and finishes on The Mall and takes in lots of famous London sights along the Embankment, through The City and back. The race started at 10am so thankfully it wasn’t too early a start but as I made my way to Green Park I realised just how warm it was. I haven’t trained in the heat at all and I realised that it might well make things difficult for me, and everyone else. I arrived at Green Park, dropped off my bag, picked up some water and made my way to The Mall to join my starting pen – green B towards the back of the field. 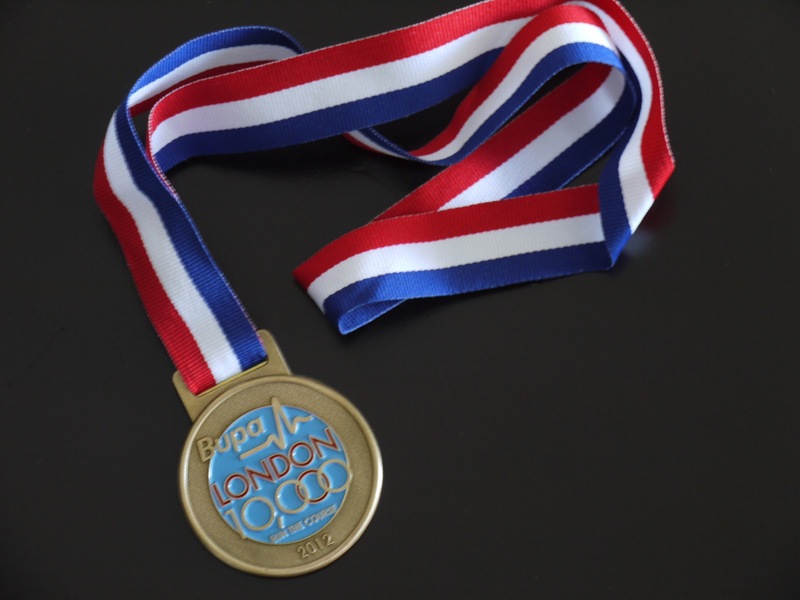 The event is run by the same people as The London Marathon and the organisation felt slick and familiar. Before long it was 10am and the elites were underway. 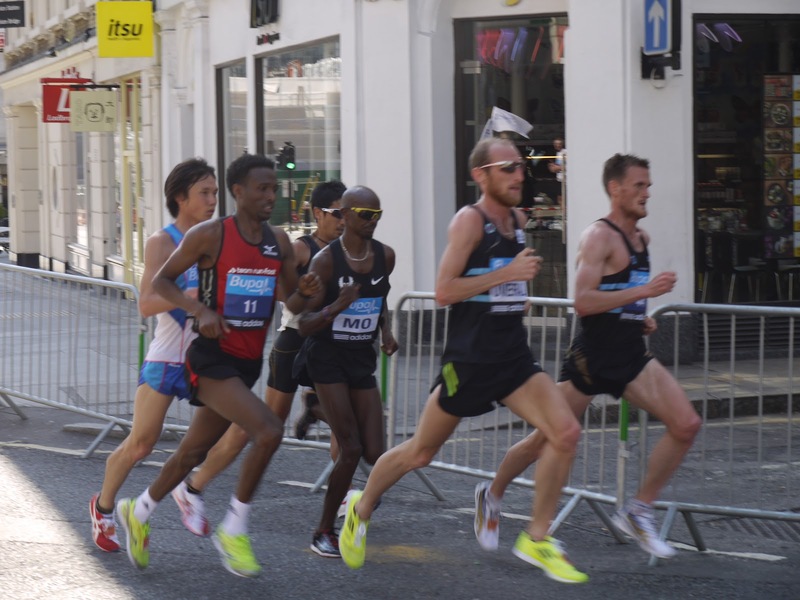 There was an impressive sounding field with Mo Farah, Scott Overall and Mara Yamauchi among the British runners. We were started in waves and before long it was our turn. 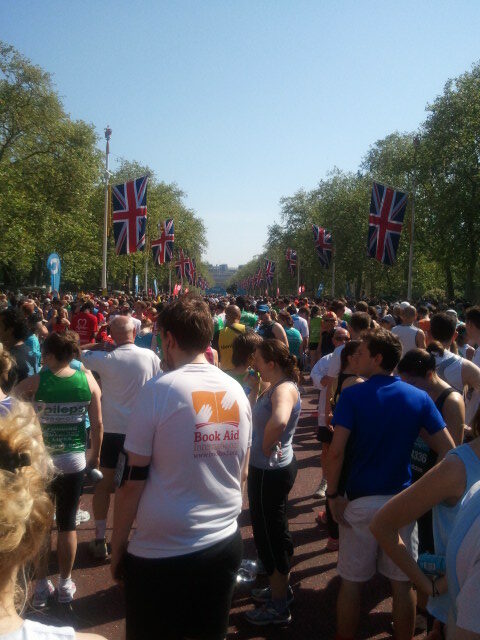 We moved towards the start line and were soon off, running down The Mall, through Admiralty Arch and down Whitehall. The first mile, as with most races, felt easy but I was really surprised when my Garmin beeped at me to tell me that I had completed it in 9 mins 49 secs – my fastest ever mile. I didn’t feel like I was running that fast and at that point there was a nice breeze along The Embankment so I wasn’t feeling the heat too much. That soon changed and when the first water stop appeared just after 2K I was very relieved – so was everyone else judging by the queue that formed around the tables. I walked for a while to take on some water and then set off again towards the 3K marker where I knew Mr J was waiting. He’d been there for a while and had managed to see the elite men go past and take some great pictures of everyone running past St Paul’s. I spotted him as I ran past St Pauls and gave him a wave as I went past. 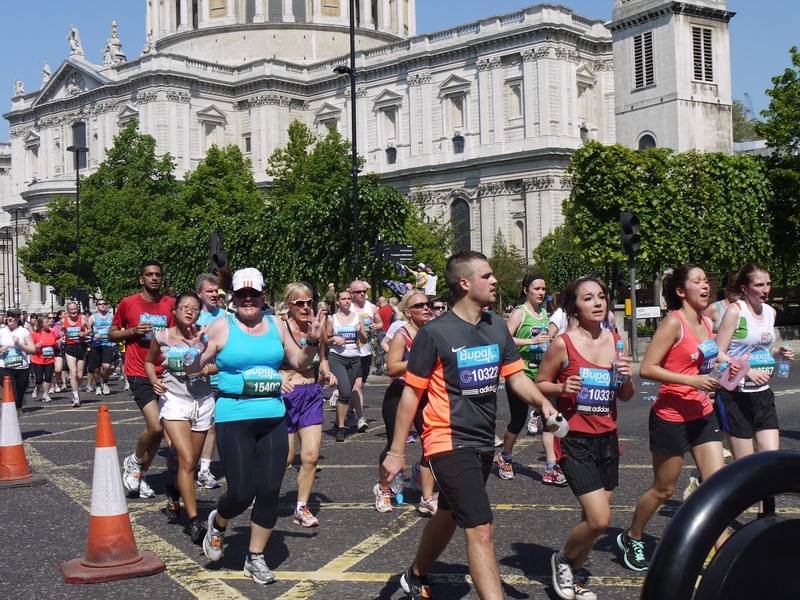 The course made it’s way through the City, past the Bank of England and the towards the Lloyds building where it turned right and went through Leadenhall Market. This was a great part of the course with some much needed shade and a brilliant drumming band making a lot of noise in the market. Before long we were at the halfway point my Garmin said around 35 mins and I felt as if I had a chance of beating my best time at 10K of 1hr 12 mins. But it wasn’t to be. Not long after the halfway point I twisted my ankle in a dip in the road that I hadn’t seen. It hurt and I stopped for a bit trying to put weight on it to see what would happen. It felt just about OK to walk on so I limped along gingerly for a while hoping to walk it off. We were now headed back towards The Embankment and I was close to the spot where Mr J was going to be waiting for the second time. I looked a bit of a sorry state as I limped my way towards him. He checked that I was OK – I said that I was and was going to carry on and hope that my ankle would feel good enough for me to run again. He waved me on my way and I carried on walking, trying a bit of a jog here and there for the next few kilometres. Before long we were back on the Embankment and headed towards Big Ben and the final 2K. My ankle felt OK – not 100% but good enough for a bit of a jog so I ran as much as I could of the last part of the race. It was so hot and there was hardly any breeze or shade to be found. I turned the final corner of the race back onto the Mall and ran the last 200m with as much energy as I could muster. I crossed the finish line in 1:18:48 according to my Garmin which I was pretty pleased with given the heat and what had happened to my ankle. After crossing the finishing line we had our timing tags removed and were given goody bags with our medals and T-shirts, in scenes that were again very reminiscent of the organisation of the London Marathon. I made my way to pick up my bag and make my way home, desperate to get out of the heat and under a cold shower. I know I am capable of a better 10K time than this and now have 6 weeks before the British 10K on July 8th to train properly to make sure that I achieve the best time that I possible can. Bring it on! Previous Operation toe touching Becca! Next The perfect running bag ?